Kelsey first stepped on to her yoga mat in 2011 while living in Boston and navigating life in her early twenties. Being active through sports and dance growing up, she of course enjoyed the physicality of the yoga practice although soon realized that wasn't what kept her coming back. Her yoga mat slowly became what felt like home to her. A place to find stillness and quiet among the stresses and over-stimulation of everyday life in a busy world. Over the next few years she continued to practice and little by little began realizing the benefits yoga was having on her overall well-being. 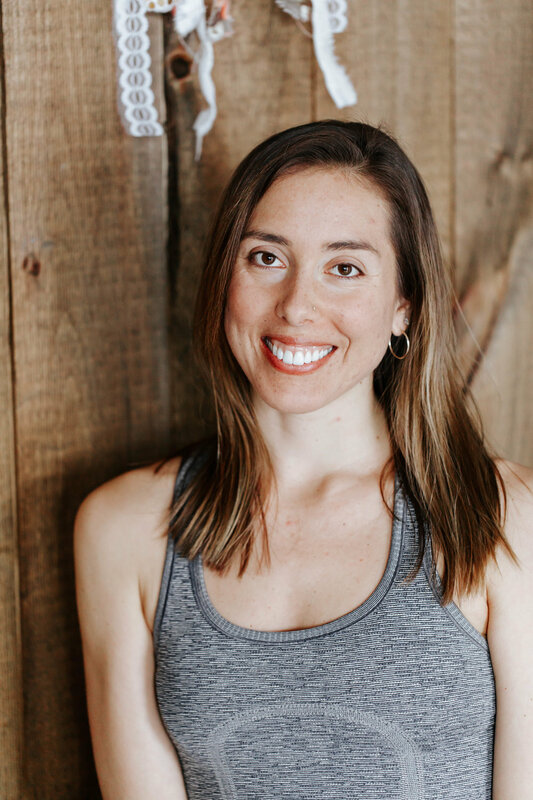 Upon moving back home to Connecticut in 2014 she enrolled in her first 200 hour Vinyasa teacher training under the guidance of Mitchel and Tracy Bleier. Kelsey is also certified in Gwen Lawrence’s Power Yoga for Sports and has worked with high school and college athletes for the past three years. She stays committed to a path of learning and is continuously studying with various teachers through workshops and retreats. Kelsey's classes offer a well-rounded physical practice focusing on proper alignment and using the breath as a tool to anchor in to the present moment. You can always count on a heart-warming playlist and a reminder to practice your yoga not only on the mat but off of it as well. Amy is a 500hr RYT Yoga Teacher and C-IAYT Yoga Therapist. She is so grateful to have begun her practice at the age of 18 and has not looked back since. Amy did her first 200-hr teacher training at Joschi Institute of Manhattan in 2013. Her early teaching days were very influenced by one of her first teachers, Gina Lee in Long Island, NY. The roots of her practice and teaching are in Vinyasa Yoga, a strong and integrative flow. Currently her practice and trainings have evolved into Yoga Therapy; a therapeutic, individualized variation to the practice. This approach to Yoga takes into account our unique situations and invites the practice to be molded to suit us, rather than us to suit the practice. In 2015, Amy began Yoga Therapy training with Inner Peace Yoga Therapy, based in Durango, CO. Learning under the guidance of senior teachers such as Neil Pearson, Maria Mendola, Dr. Marc Halpern, Nischala Joy Devi , Amy Weintraub, Laura Kupperman, and Michele Lawerence. It is her passion and privilege to have worked with many individuals over the past 4 years and to watch the impact Yoga has on their physical, emotional, and spiritual well-being. Yoga has helped Amy soothe and heal anxiety and physical discomfort. Being a Yoga Therapist has bridged her passion for Yoga and purposeful desire to help others. It is her dharma (purpose) in this life. Her intention is to remind her students that we are whole complete beings already and Yoga helps us remember that. Katie Graham (RYT)- Kate grew up in Wallingford, CT, graduated from SCSU and has been practicing yoga since 1998 to combat chronic pain and anxiety, falling in love with the mind-body-spirit benefits of yoga ever since. Kate completed the CrossRoads Yoga Teacher Training in October 2015 at Soul Space Yoga under the direction of Crystal Sullivan and Shelley Nyren after looking for a career change. Choosing to pursue a career and ultimately pairing it with something that she loved, it was then with passion that Kate discovered the love for teaching and sharing the benefits of yoga. Kate truly believes the whole world should practice yoga and feels very honored to be working in a field she loves every aspect of. When pondering why chronic pain was a permanent part of her life path, the answer arose; to truly feel and be able to guide heartfelt slow and gentle yoga style classes. Choosing to see life's offering as a gift, Kate realized that meditation and gentle yoga helped to balance her busy lifestyle. She learned how to cultivate a calmness in an ever changing world and that specific asanas and pranayama could help to combat her chronic pain. Kate has firsthand experience the healing powers of yoga and loves to share those benefits with others. Kate feels honored each and every time someone shows up to her classes to practice self care. In Kate’s class you will learn to find stillness through restorative poses, peace through pranayama, and calmness by meditative suggestions. You can find Kate teaching gentle styles of yoga classes including Restorative and Yoga Nidra. Kate also loves bringing yoga to the children's community by leading kids and family yoga classes as well. When Kate isn't practicing or teaching yoga you will find her enjoying time with her husband, two sons, dog and close family and friends. Kate also enjoys walking, cooking homemade food for family, the warm weather, the beach and enjoying good food. 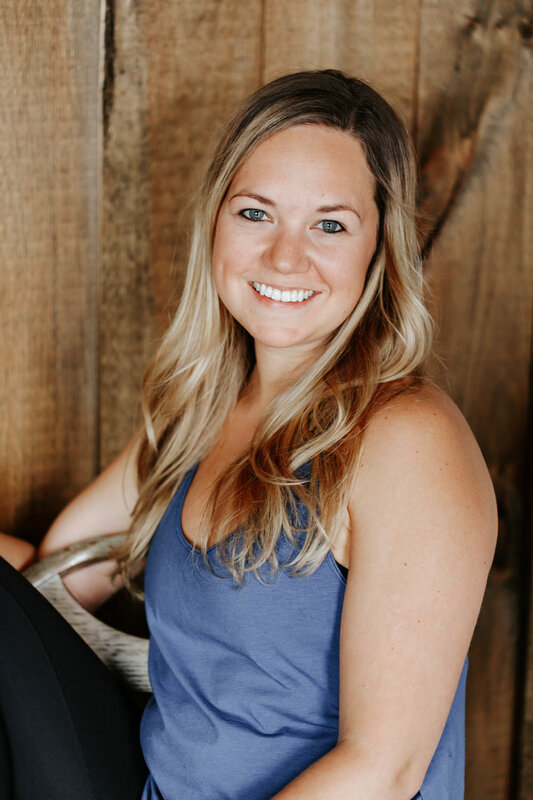 Amy Nelson E-RYT200/RYT500, YACEP comes from an occupational therapy background; being professionally trained in alignment, proper body mechanics and how to rehabilitate the body in a wholistic way. Brought to yoga for relief of anxiety, she quickly felt the lasting benefits of a consistent yoga practice. Amy completed both her 200hr and 300hr trainings from CrossRoads Yoga Teacher Training located within Soul Space Yoga and Wellness in Plantsville, CT under direction of Crystal Sullivan and Shelley Nyren. She is also trained in mindful resilience through the Veteran's Yoga Project to teach trauma-sensitive yoga. Amy believes that learning how to control and direct your breath through pranayama practices can have lasting benefits for the mind, body and spirit. She also practices meditation with mantra and loves exploring the use of mudras. Her classes challenge your body awareness, balance and strength. Students are safely taught modifications and alignment left able to explore the depths of their own practice with grace. Bre is a Wallingford native, lifelong athlete, and graduate from Philadelphia University. It was in college where she began her yoga journey after an injury in Collegiate Rowing. In 2007, Bre began to use yoga to rehabilitate her injuries and was immediately hooked on the elating feeling of a practice coupled with the innate self-healing capabilities. What kept Bre coming back to her mat was Vinyasa Yoga's creative continuous movement and ability to take her to a deeper place within herself. After practicing Vinyasa yoga for seven years, she knew she wanted to bring the same feel good benefits to others and signed up to receive her 200 HR RYT from Mitchel and Tracy Bleier. She began teaching in Fairfield County and continued to integrate yoga and meditation into her everyday. Since beginning her yoga journey Bre credits much of her personal growth to yoga, meditation, and making time on her mat to do her own work. She enjoys bringing colorful meditations with color cards, hands-on adjustments, and good vibes to class all with the intention to work inward together as a community. Bre loves a good hike, spontaneous travel plans, trying craft beer and fine wine, and always connecting with like minds. Though most of her classes are vinyasa, Rebecca enjoys teaching a variety of styles of yoga. Whether restorative or vigorous, she seeks to empower each student with self-care knowledge physically and mentally, always encouraging and hoping to inspire a consistent home practice. She draws on her dance background for creative movement, her personal injury recovery for modifications and healing, and her military years to bring discipline and strength to the mat. Rebecca is honored to teach in both 200 & 300 hour programs for Lara Ward’s Lotus Gardens Yoga School and to be an ambassador for Veterans Yoga Project with Daniel Libby, Ph.D.
Kallie discovered yoga in high school as a way to cross train for competitive swimming, and quickly saw the benefits of yoga for dealing with anxiety and depression. Having benefitted so much from the healing power of yoga, she was inspired to share this practice with others. Her freshman year she enrolled in YogaFit level one training in vinyasa and began teaching at Quinnipiac University, Edge, and LA fitness. During her junior year Kallie was enrolled in a class called “Can yoga change the world” in which she studied the 8 limbs of yoga and had the opportunity to travel to Bali for a yoga retreat. During this experience she was inspired to save up for her 200 hour yoga training which she completed a year later with Sadhana yoga school under Anjali and Bryan Russel. She is currently enrolled in her first year of graduate school at Quinnipiac University’s Doctor of Physical Therapy program. She has a strong background in anatomy, alignment, and biomechanics. Kallie believes in the healing and transformative power of yoga for both the mind and the body. Her goal is to one day integrate yoga into her physical therapy practice. Her classes emphasize body awareness, alignment, breath control, and balance. Kallie’s hope is to encourage self love and mindfulness through a relaxed and grounded practice! DJ Rubin (David J Rubin) was born CT, raised in Wallingford, attended and graduated from the University of Connecticut in 2011, and received his RYT 200 Certification at Soul Space in Southington, CT July 2015. He is a superfan of the UConn Huskies, has a passion for classic rock concerts, enjoys golf, and loves ultimate frisbee. His yoga journey began simply by bringing a mat and an iPad with P90X Yoga outside under a tree on hot summer days in 2014. As a longtime high energy MC entertainer, David felt he found the yin to his yang with the soothing and relaxing practice of yoga. With the vigorous demands of dance engagement and event hosting, he found yoga to be the perfect recovery. It wasn’t long until he found Soul Space, fell in love with their vibe, as well as the science, history, and spirit of the tradition, and found a new outlet to create and deliver health & wellness to others. With more than a decade of a live DJ background, David brings a unique musical experience to his classes, measuring every beat from warm up, to cool down, to match the energy and pace of his class. While living in NY and teaching at Chalk Gyms in Williamsburg, Brooklyn, David created and taught a signature class TrancePose, combining various musical genres from trance, deep house, as well as throwbacks combined with an energizing and invigorating flow. David teaches everything from All Levels, Vinyasa Flow, to Gentle, Power, Yin, and even Children’s classes as he was a lead instructor at Farmington’s Camp Courant’s ‘Wake Up & Relax” program. DJ begins every class by saying: "Your mat is your own personal island. Whatever you want to do on your island, is totally up to you. My voice is simply here as a guide. Most of all.. listen to your body. Take what you need, and leave the rest behind.” David takes great care that every student, from first timers to the more advanced, finds their level of comfort and challenge each time they step on their mat. Christina began her yoga practice in 2000. Unknown at the time, was that it would be her saving grace through great change and loss. She was fortunate to be able to learn, practice, play and explore yoga every day through many different genres for many years. In 2006 she completed her teacher training with Kim Valeri of Yoga Spirit, and has been teaching ever since. She has studied and trained, as well, with Seane Corn in Vinyasa, Judith Lasater in Restorative, Josh Summers in Yin, Lani Rosen-Gallagher in Full of Joy Yoga and recently trained with Ombirths in Prenatal Yoga. Over the years, she has also done countless hours with Ana Forrest and Rolf Gates. She believes yoga is one of the greatest catalysts for change in all the ups and downs that life holds, and breath, the magic to inner peace and self love. Come breathe and move, share peace and love. See you on the mat.